Professional investors understand that a major long term driver of stock index prices are the projected future earnings of the index. 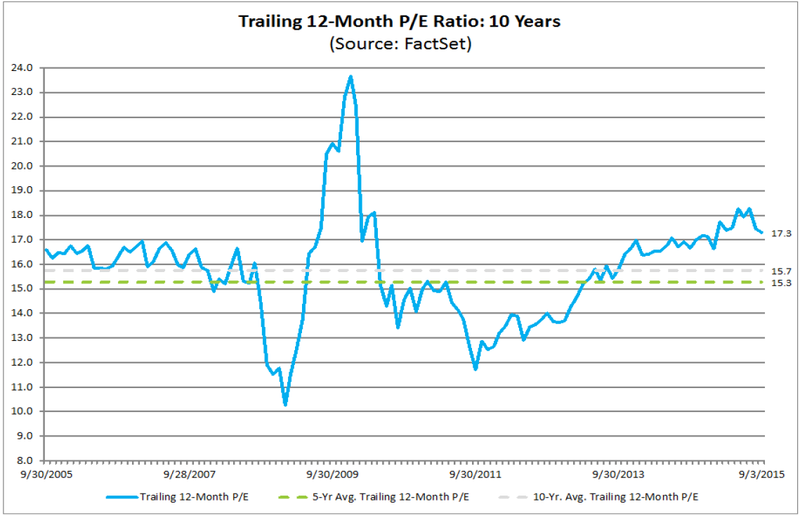 When earnings decline, as measured over the Trailing Twelve Months (TTM), the index adjusts to reflect current earnings. If earnings are trending higher, the market typically trends higher. At the moment, TTM earnings on the S&P have lost momentum and the market is merely adjusting. Estimated future earnings are also lower, albeit temporarily. Chart #1 below illustrates actual earnings over the last twelve months (TTM) as well as the S&P 500 Index Price. 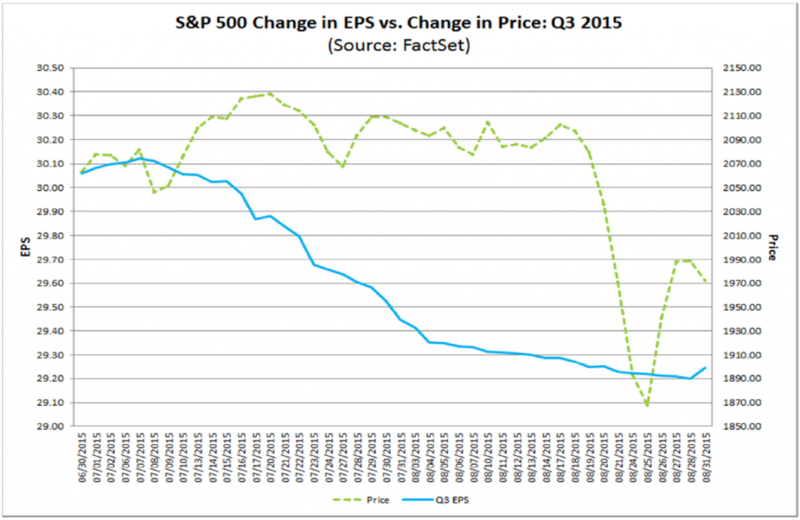 (Chart courtesy of FactSet). S&P 500 actual TTM earnings have been trending lower, becoming an anchor on the leading stock market benchmark. Eventually, the index succumbed to the drop in earnings and traded lower. Lower quarterly earnings are typical in a business cycle as pockets of a slowdown within an expanding cycle are to be expected. However, the rate of the current earnings drop is slowly subsiding. Based on average estimates we see earnings beginning to rise above current estimates in the 1st quarter of 2016 and exceeding all previous earnings estimates by the end of the 3rd quarter of 2016. The key in the valuations of companies in the S&P 500 are future earnings and the likelihood of achieving those earnings targets. 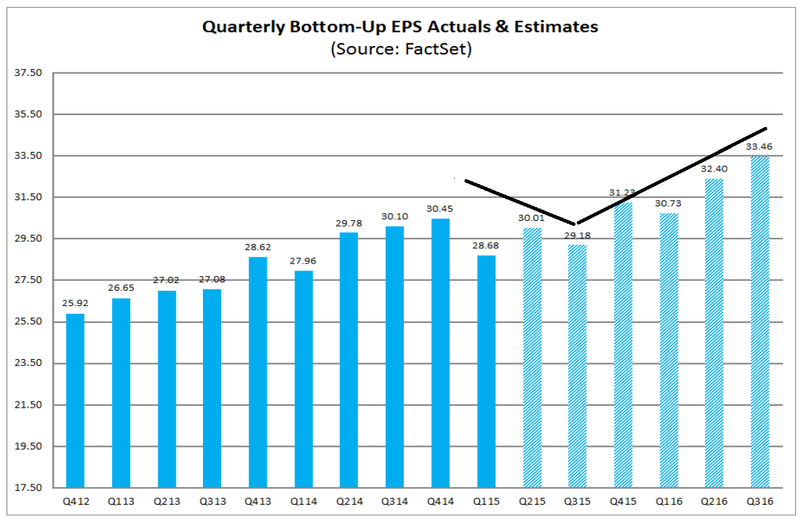 Chart #2 (Courtesy of Factset) below illustrates future earnings estimates to be flat and lower through October 1, 2015 as indicated by the downward sloping line. Fortunately, earnings are expected to pick up and retrace the lost earnings by the end of the second quarter of 2016, (July 1st 2016). By October 1st of 2016, the averages of all IBES analysts’ estimates expect all prior earnings levels to be exceeded. The economy is expected to pick up speed in the latter part of 2016 and into 2017 which should bode well for the S&P 500 Index at that time. Adding the estimated future earnings of the next 4 quarters from the Chart #2 above (Q4 2015, Q1 2016, Q2 2016, Q3 2016) we get a total of $127.82 for the S&P 500 future earnings estimates. Chart #3 below is the historical earnings multiple of the S&P 500, also widely recognized as the Price to Earnings Ratio. Given our index valuations, long term Investors should increase monthly dollar cost averaging funds currently being deployed on a monthly basis to their portfolio, especially when Index prices are below the long term 10 year multiple price target calculated (2007). As of this writing the S&P 500 is sitting at 1970, below fair value based on 2016/2017 target level using the 10 year and 12 month Price to Earnings Multiples. Three main components are utilized to determine the Equity Risk Premium; 1) Earnings, 2) What a company does with those earnings, and 3) The risk-free rate of interest (US Ten Year Note as a proxy). When companies create earnings, they can compensate shareholders either by paying a dividend, purchasing its own stock, or both. Keeping the math simple and using the S&P 500 as a proxy, we take the Dividend Yield of the S&P 500 and its Share Buyback Yield and add them together. Today the S&P 500 is paying 2.04% in dividends and spending 3.4% of its market capitalization in buybacks making the total yield to investors 5.42%. The US Ten Year Treasury Note is currently yielding 2.12%. Thus the Equity Risk Premium of stocks over bonds is 3.3% (5.42%-2.12%). Given this estimate, investors are being compensated a “premium” of 3.3% for the additional risk taken when investing in Equities over the 10 year US Treasury Note. Thus, professionally managed investment portfolios should overweight equities versus bonds for investment time horizons of 10 years or more. At the present premium, we advise clients to dollar cost average a larger portion of their portfolio contribution into stocks versus bonds if their time horizon is 10 years or longer. We also advise clients to dollar cost average additional funds on a monthly basis at levels below fair value levels we have calculated for the S&P 500 using the historical Price to Earnings multiples above. Our QCI Value and Growth Portfolio, a portfolio of 40 stocks selected using our proprietary process based on the principals of Warren Buffett, Peter Lynch, and Benjamin Graham is currently exceeding the return of the S&P 500 in 2015 by over 5.5% after all fees. Contact John Henek, 708-267-0627 john@quantumcapitalinvestments.com for more information. QCI Inc. is a full service financial planning/tax planning and business consultancy firm. QCI is Registered Investment Advisory and Fiduciary. If you have questions regarding our newsletter or would like to have our industry specialists review your investments, taxes, insurance or have business related matters feel free to contact us at the number below.